There are so many year-round top-notch sites to visit around the Lowcountry… case in point: Magnolia Plantation and Gardens, spotlighted in the last blog. Hard to believe, but it’s open 365 days of the year. Here you’ll find the must-see/do things when you are here staying in one of our luxury beach house rentals SC, whether it’s a luxury house on Isle of Palms or a Folly Beach house Charleston. There’s also no shortage of great special events, once-a-year happenings with all kinds of themes. Some have been going on for decades, while others are springing up for the first time. There are a couple such events going on this weekend that look to be a lot of fun — an especially good way to both entertain and feed everyone staying in your Charleston beach house. First up is the Smoke on the Harbor Barbecue Throwdown, now in its third year. It’s a fully sanctioned national event, under the auspices of the KCBS (Kansas City Barbecue Society). These pit masters are serious, hard-core men and women who have their eyes on the BBQ prize… and you get to be the lucky beneficiary. It’s going on Friday from 5:00-9:00 p.m. and Saturday from 11:00 a.m. till 5:00 p.m. at the Charleston Harbor Resort & Marina, at 20 Patriot’s Point Road in Mount Pleasant. It’s a convenient drive from all our rental homes South Carolina. From our Isle of Palms vacation rentals, head over Sullivan’s to Coleman Boulevard in Mount Pleasant, and turn left right before the base of the Ravenel Bridge. For those staying in Folly Beach house rentals Charleston SC, head over to the peninsula, cross the Ravenel Bridge, exit to the right onto Coleman and take your first right off the bridge. Just follow the smoke! There’ll be samples of pork butts and chicken wings as well as other food and drink available for purchase. Mmm, mmm… I bet it’s gonna smell fantastic out there, with all those grills going at the same time. There will also be live music, a large vendor village, a cocktail competition and kids’ zone. Tickets are $10 general admission, although if you bring a non-perishable food item to be donated to the Lowcountry Food Bank, you’ll get $5 off at the gate. Then on Saturday is the first-ever (but hopefully not last) Shuckin’ on the Yorktown. An oyster roast is a longstanding, beloved Lowcountry tradition, a way to enjoy a gem of the ocean while having fun with friends and family around the shucking table. Like the name implies, it will take place on the deck of the aircraft carrierUSS Yorktown. It’s the first time ever that there’s been an oyster roast on the historic ship, so it’s a pretty big deal. The event is being sponsored by East Cooper Ducks Unlimited. For your GPS, the address is 40 Patriots Point Road in Mount Pleasant – just up the street from the BBQ Throwdown, and an easy drive from all our SC vacation rentals, especially our Isle of Palms luxury rentals. 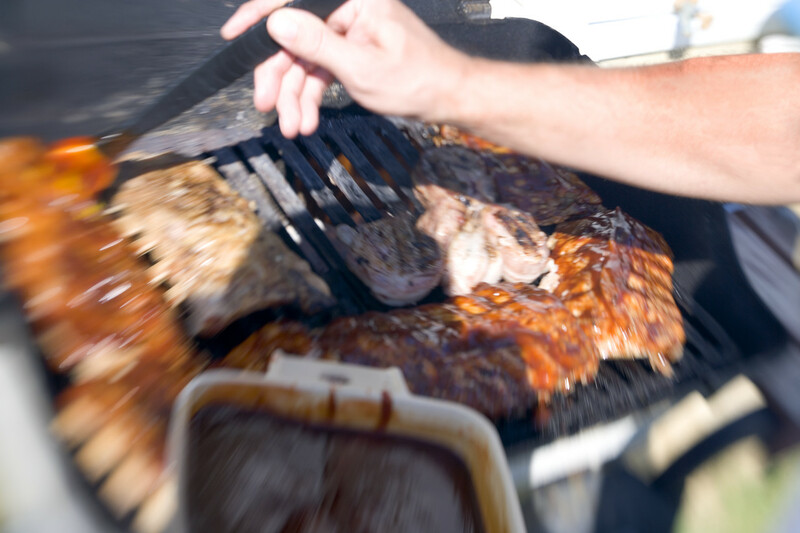 So enjoy some southern classics – BBQ and oysters — and be sure to call EP for the very best in beach rentals Charleston.